Whenever I have friends from out of town visit, one part of my Boston tour is to take them to Legal's for some clam chowder. I love that stuff. And most visitors do too. I honestly haven't done a sampling of chowders from different area restaurants, I usually just go to Legal's. So the Chowderfest this Sunday, July 5th might be a good opportunity for me to broaden my chowder horizons. 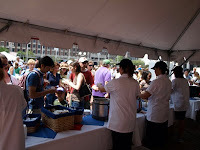 This year's Chowderfest is Sunday July 5th, 2009 from 11am to 6pm, and it attracts restaurants from all around metro-Boston to compete for the title of "Boston's Best Chowder." More than 2000 gallons of New England's signature dish will be ladled out to a crowd of over 11,000 enthusiastic chowder-samplers in this fun-filled Boston tradition. Admission: $10 adults/$7 children under 12. 0 Response to "28th Annual Chowderfest - 7/5"